In the blessing at the conclusion of the Holy Matrimony service, the prayers of St. Prokopios* (commemorated on July 8) and those of Sts. 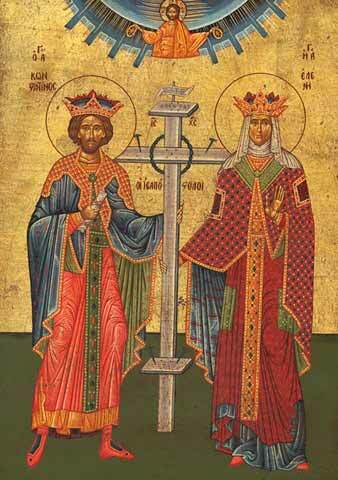 Emperors Constantine and Helen (commemorated on May 21) are requested, as they are considered as protector saints of marriage. But I have been asking myself why the Church considers Sts. Constantine and Helen as intercessors for marriage? By mentioning them together in the service of Holy Matrimony, is confusion not perpetuated (or created) among some believers that they are husband and wife? Reading about the lives of these protector saints of marriage, we find some striking similarities between them. Just as Constantine the Great had a strong relationship with his mother who was instrumental in bringing him to Christ, Prokopios also had a strong relationship with his mother Theodosia. The difference is that Prokopios led his mother (who was a strong pagan believer) to Christ. Another similarity is that both St. Constantine and St. Prokopios had a vision of the Holy Cross. Most of us are familiar with the revelation to Constantine, which changed the course of Salvation history. The vision of the Holy Cross was instrumental in Constantine’s decision to make Christianity the official religion of the Empire. It also empowered his mother Helen to travel to the Holy Land to find the holy places where our Lord lived, walked, taught and ministered unto us and to build churches on these sites. Reminiscent of St. Paul the Apostle, St. Prokopios, who was at one time a general in the Roman army of Diocletian, was sent to Alexandria to destroy those “who believe in the One who was crucified.” About three o’clock in the morning, while on the road to Alexandria, an earthquake shook the ground and there was lightning and thunder. Prokopios heard a voice from Heaven asking him, “O Neania (which was his name as a pagan), do you come against Me also?” A bright cross appeared in the sky and the voice continued, “I am Jesus the Crucified One, the Son of God.” The cross went up to Heaven and the voice spoke again saying, “In this sign that you saw, you will defeat your enemy and My peace will be with you.” The Holy Cross, which led these Saints to the true faith, united them in the Body of Christ and protected their lives, is also the guiding sign of Holy Matrimony. The experience of the Cross is what made these Saints the praying protectors of Holy Matrimony. Of course, we acknowledge the fact that “the cross we all must carry" in our following of Christ is part of marriage. However, the cross is also associated with marriage, because marriage is seen as a fight. This fight is not a struggle between two persons trying to work out their differences and making the marriage (the “becoming one”) work, as we might simplistically see it. This is a good fight, a “warlike” fight, the husband and wife become partners, and they help and support one another. We understand marriage in this way as a school of virtues. In marriage, the natural gratification of the pleasures of the flesh is sanctioned by God as an expression of true love between a husband and a wife and as a means of perpetuating mankind. In regard to this, St. Paul says, “But I say to the unmarried and to the widows: it is good for them if they remain even as I am (unmarried): but if they cannot exercise self-control, let them marry. For it is better to marry than to burn with passions.” The Cross of Christ is part of marriage, for in this sign, marriage will succeed, will conquer, will destroy the enemies of our souls and will find the peace of God. Sts. Constantine and Helen are considered as intercessors for marriage, because they were crowned emperors: “God-crowned Kings and Saints-equal-to-the-Apostles.” Marriage is also called “the crowning” (cununia, the Romanian word for Holy Matrimony, comes from the noun cununa, meaning crown), for in marriage, a crowning takes place. The new couple indeed becomes King and Queen, being crowned for each other. Their crowning is recognized on Earth and in Heaven. They start a new dynasty, and a new little church,” which can last until the end of the world through their offspring. What I believe is more important is the fact that Sts. Constantine and Helen’s crowns were received in Heaven. We know the same thing about St. Prokopios, who died as a martyr for the faith in Christ. From the Heavenly place, these saints pray that the crowned servants of God in Holy Matrimony will also become worthy of the Heavenly Kingdom. Let those of us who receive the crowns of Holy Matrimony, remember that marriage will succeed only when it is under the protection of the sign of the Holy Cross.